On March 13th 6 of us left Singapore for 7 days in Yunnan Province, starting our adventure in the city of Lijiang. We arrived early evening and checked into the Banyan Tree Hotel. The hotel is made up of seperate villas spread out over several acres. We had room 212, a perfect location easy walk to the restaurants and spa. The next day our guide, Anna, arrived early to wisk us off on our adventure. The cherry blossoms were just beginning to bloom and the many willow trees that line the streets were beautiful lime green. 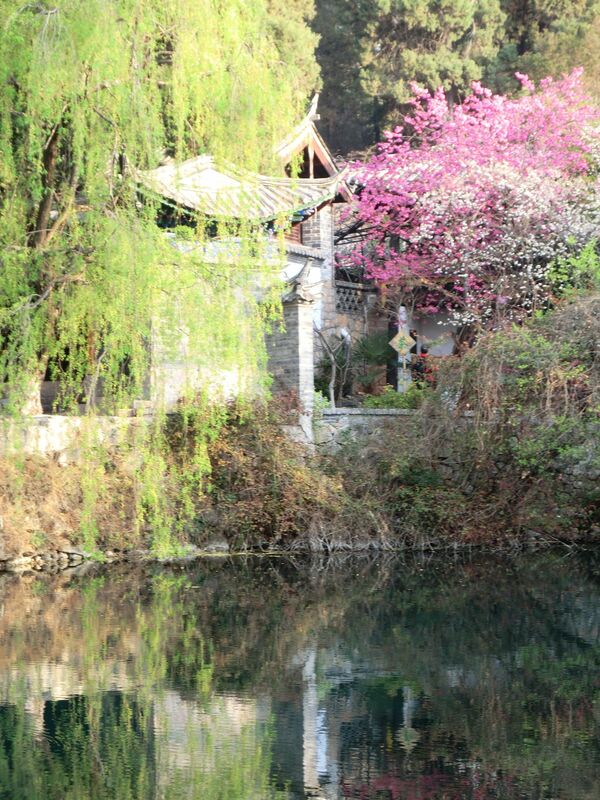 Our first stop was the Black Dragon Pond, a lovely park with many ponds and when the water is high several waterfalls. The people of the area are great dog lovers so we saw the early morning dogs and their owners. There is a lovely village close by that still holds all the old traditions of the area. The tiled roofs, old wood doors and local people still doing their wash in the small stream of water along the walk ways makes you realize that this is an area that is in transition. 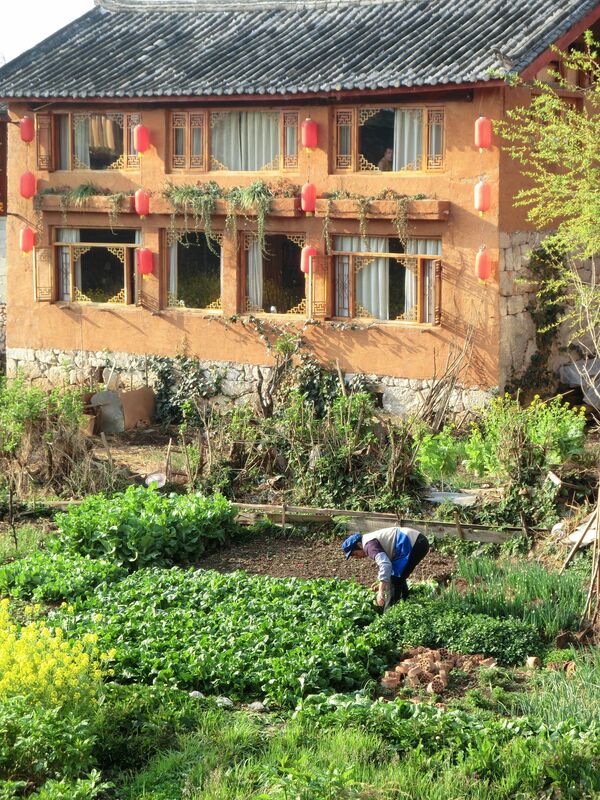 The Naxi people of this region are farmers and their gardens produce beautiful green vegetables that we were served at every meal. We wondered the narrow cobbled streets in the old town, through a maze of canals, old wooden buildings and back street markets filled with Naxi women in traditional dress. Each of us found a few treasures to being back home. The art of bargaining took all of our energy as we each bought unique gifts for ourselves and family back home. Back at The Banyan Tree Hotel we ate in the Asian restaurant and were served beautiful dishes with many of the greens and vegetables we had seen in the market. The next morning we ventured out of town to local villages Longquan, Baisha and Yuhu where we explored old collection of murals and photos taken in the 1920’s by Joseph Rock. The average woman in these areas live to be 82 years old, they focus on happiness and family. The people in these villages are farmers and work their small plot of land raising the food they need and animals, yak, black pigs, cows and a few chickens. Their small simple homes had no heat, many just receiving electricity in the past couple of years. There was a small fire burning on the floor in the kitchen where the tea pot sat ready for the next cup. The next morning we left the hotel early to drive to Jade Dragon Mountains for the amazing “Impressions of Lijiang” show. The backdrop is a series of snow topped mountains. 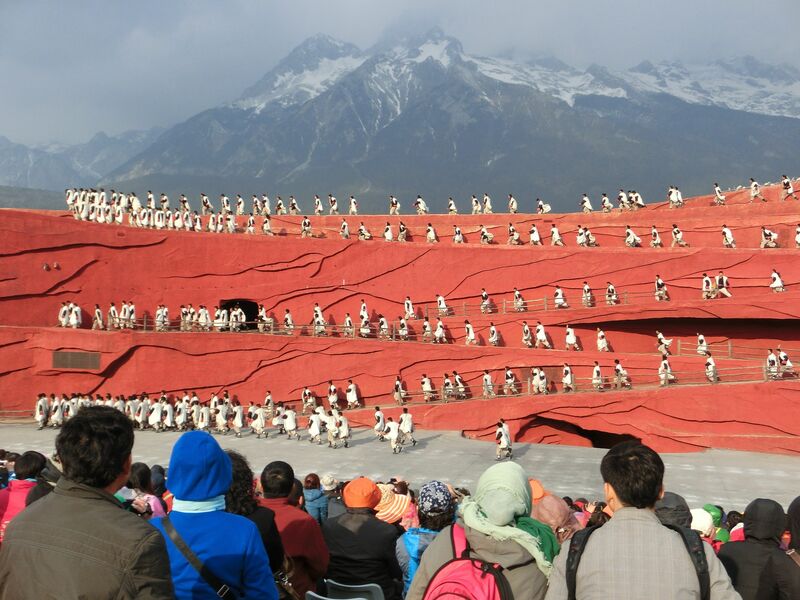 You are sitting at 10,600 feet watching a production choreographed by director Zhang Yi Mou and involves more than 500 dancers in their ethnic costums. It was so cold we thought we would never make it until our guide, Anna, rented huge orange coates for us to wear, about $2.00 each. After the 1 hours show we headed out for a 4 hour drive to an area called Shangri-La. The area is on the Tibetan plateau. On our way we drove along the Yangtze river stopping at a very famous “Tiger Leaping Gorge” This is one of the deepest gorges in the world, also one of the narrowest. We climbed down the long series of steps to the lowest platform and then back out, over 1000 steps. This time of year the river and falls are very low, this will all change when the rains begin. After the gorge we drove another 3 hours to Shangri-La and our hotel for the next 2 nights. 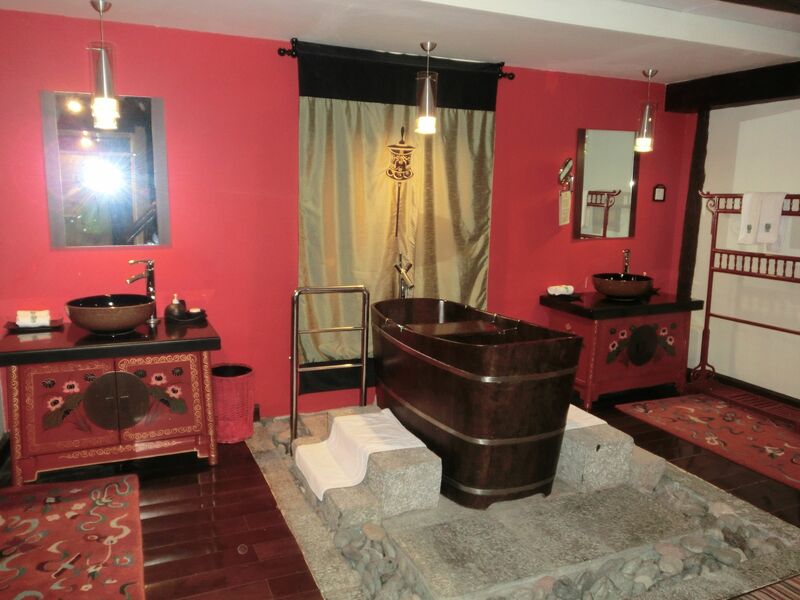 Checking into The Banyan Tree Ringha, we entered our suite to see this great bathroom and this grand bath tub. The hotel is a series of Tibetan houses that were taken apart and moved to this hill over looking a village then reconstructed and turned into a series of Tibetan suites. 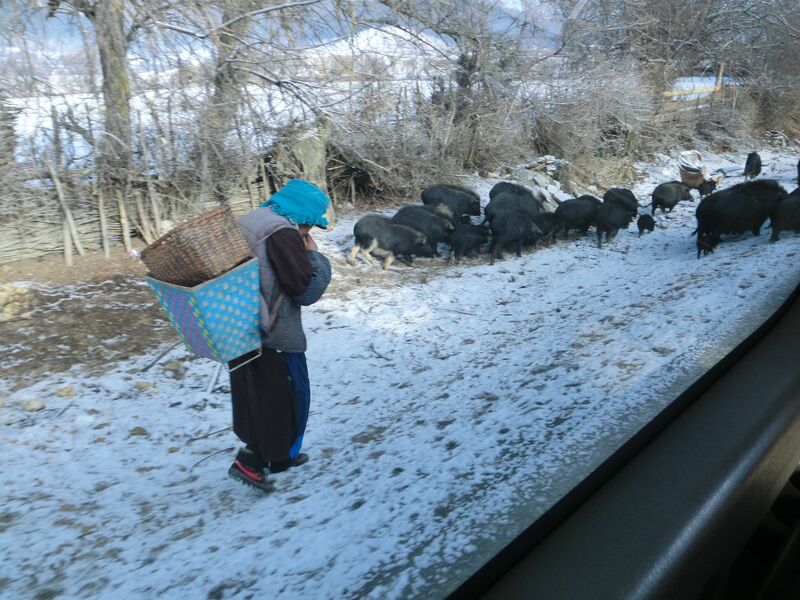 You arrive by driving through Hong Po Village on a very small remote road, while being careful to watch for all the baby black pigs along the side of the road. This area is very high in the mountains., over 9,000 feet, so there was a light snow on the ground and very cold. We were not prepared for the temperature, but found long black coats in the closet that we wrapped ourselves in as we walked to the dining room. 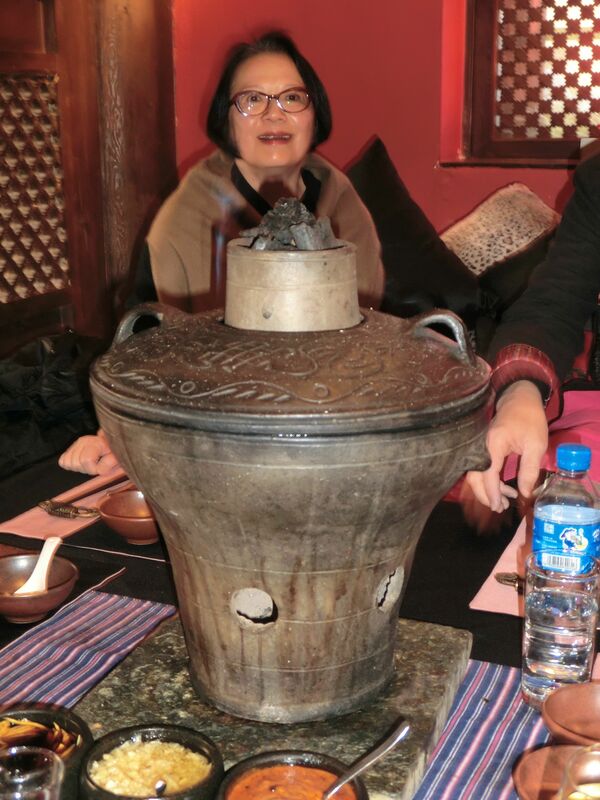 We joined each other for an exciting new experienced, the shared local hot pot. The small burner with a surround of broth is placed in the center of the table and then fresh mushrooms, pieces of meat an assortment of greens and tofu are cooked in a rich broth fondue. Bowl of fresh noodles are served alongside as well as rice to accompany the meat and vegetables. The next day we were up and ready to visit the Songzanlin Monastery. The monastery was built in 1674 and is one of the largest Tibetan Buddhist lamasery in Yunnan Province. We then headed to the old town, which today is very quiet but we had a great time shopping and sharing a simple Tibetan lunch. Back at the hotel I had an amazing hot stone massage, a welcome experience after so many hours in a car over the last 5 days. We had to go for the hot pot one last time, since the next morning we would leave for Kunming and back to Singapore on a late night flight. Kunming, the capital of Yunnan Province, was a 1 hour flight. When we arrived our guide for the day, Ms Sulu met us and helped us load our bags into the van. Our first stop was a local fast food noodle place. These noodles were simple, not spicy when served, but we watched the locals adding spoonfuls of ground chilies, so I guess to each as own. Now we were off to The Stone Forest, about a hour and half drive on a new freeway. 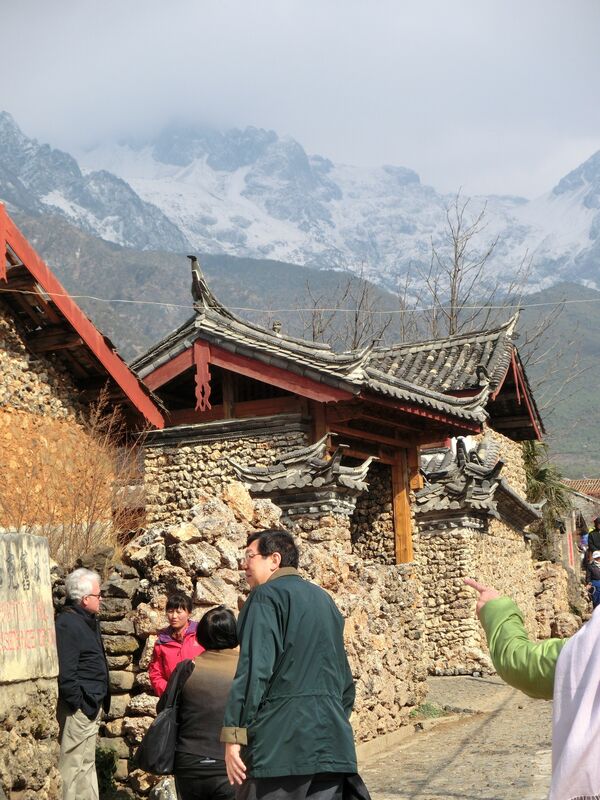 This is a huge local tourist draw with over 20,000 Chinese visiting a day. 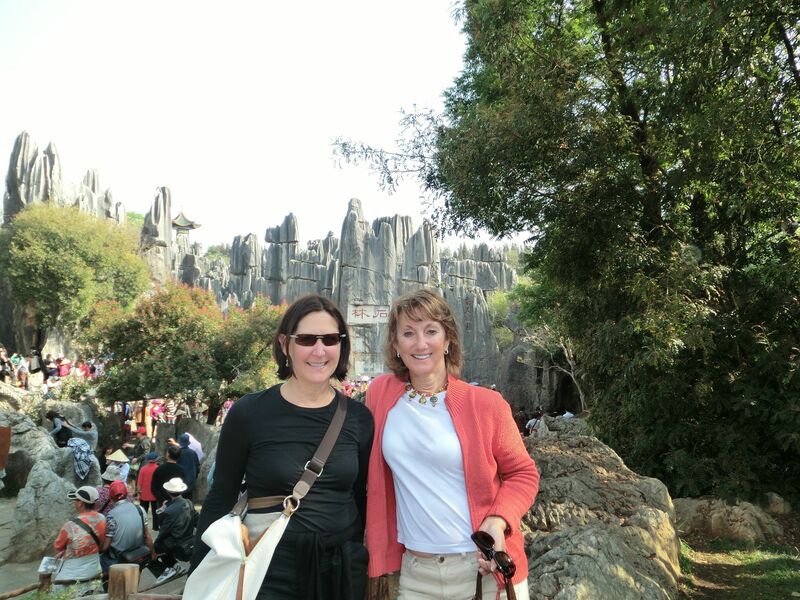 Walking through the Stone Forest you can’t help but be in awe of the amazing natural stone landscape. However, it looks like Disneyland meets Zion National Park with little electric buses rushing to massive parking lots picking up group tours and rushing back to drop off points. After a couple of hours we headed back to the city for dinner and a transfer to the airport for a 10:30pm departure to Singapore. We arrived back in Singapore at 2 am and checked into the Ambassador hourly hotel in Terminal 3 for a 4 hour rest, shower and quick nap before we headed to the transit desk for our boarding passes to Seattle. 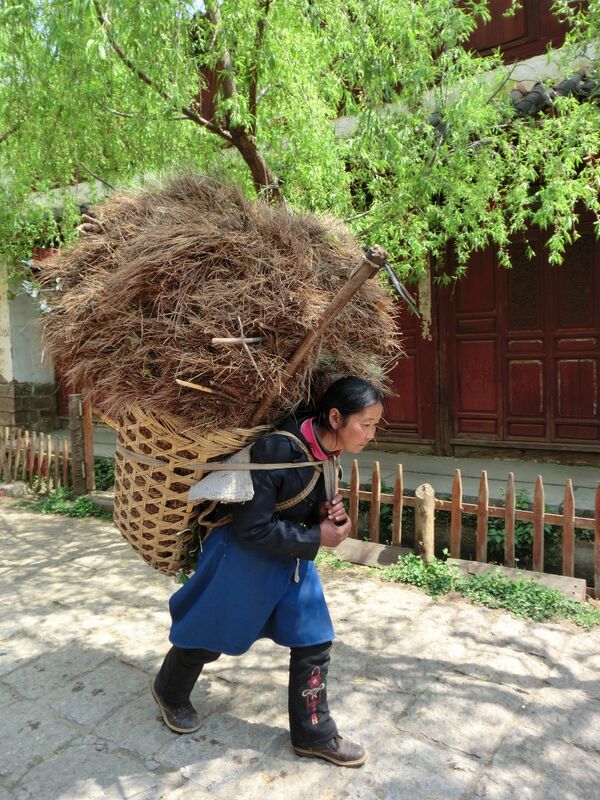 This was a true experience of China as it changes but still remains a country of farmers and a simple way of life.